NO2 is a reddish-brown gas with a pungent and irritating odour. It transforms in the air to form gaseous nitric acid and toxic organic nitrates. NO2 also plays a major role in atmospheric reactions that produce ground-level ozone, a major component of smog. It is also a precursor to nitrates, which contribute to increased respirable particle levels in the atmosphere. What are the sources of NO2? (NOx)All combustion in air produces oxides of nitrogen (NOx), of which NO2 is a major product. Approximately two-thirds or 69% of NOx emitted in Ontario in 2012 came from the transportation sectors. 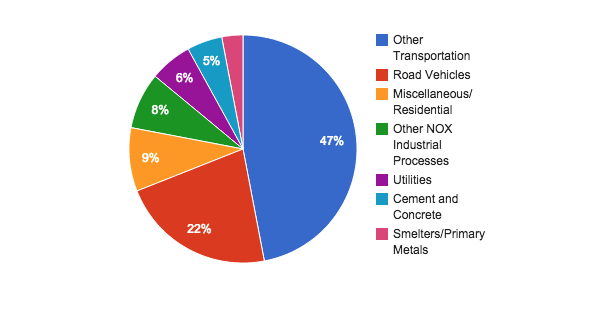 Miscellaneous/Residential was the second largest source of NOx emissions, accounting for approximately 9%. Ontario Nitrogen Oxides Emissions by Sector - 2012. What are the effects of NO2? NO2 can irritate the lungs and lower resistance to respiratory infection. Sensitivity increases for people with asthma and bronchitis. NO2 chemically transforms into nitric acid and, when deposited, contributes to lake acidification. NO2, when chemically transformed to nitric acid, can corrode metals, fade fabrics and degrade rubber. It can damage trees and crops, resulting in substantial losses. The Ontario Ambient Air Quality Criteria (AAQC) for 1-hour average NO2 concentrations is 200 parts per billion (ppb), which has been incorporated into Ontario’s Air Quality Health Index to better protect Ontarians. For more information on how the Air Quality Health Index has been modified for reporting in Ontario, please visit the Frequently Asked Questions.